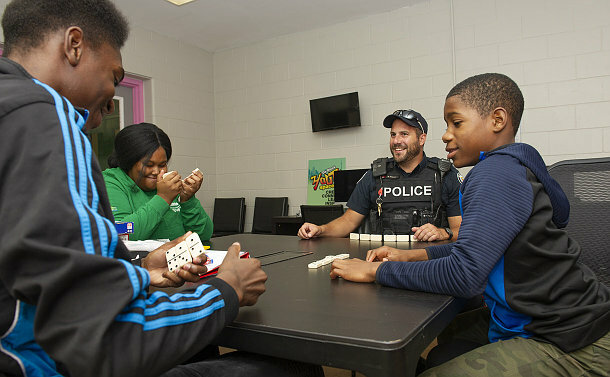 A federal grant will help Neighbourhood Officers prevent crime by empowering the young people in the communities they police. Over 350 young people from eight neighbourhoods will take part in six-month life skills program designed to connect them to the city outside of their own neighbourhood and give them new experiences and skills. The sessions will cover simple topics from eating healthy to resume writing or simply making good life choices, however, there will also be opportunity to be accredited in CPR, First Aid and food handling to make them ready for the job market. He said the Neighbourhood Officers will also get the opportunity to bring a positive program to the community they police and connect with young people and their parents. “We want to build relationships between young people and Neighbourhood Officers as well as create young leaders in these communities,” said Ecklund, noting that young people who engaged in the program will be brought back to mentor more youth. The program launches in 42 Division (Malvern, L’Amoreaux) and 41 Division (Oakridge, Kennedy Park) in April, followed by 11 Division (Lambton Baby Point, Weston-Pelham Park) and 22 Division (Islington City Centre West, Etobicoke West Mall) in May. The grant was part of $7.1 million for community programs for Toronto to help prevent crime – specifically to keep young people from taking part in violent crime. Minister of Border Security and Organized Crime Reduction Bill Blair said the funding will help address the circumstances that give rise to violence and support police officers and community leaders who are working diligently to keep communities safe. Mayor John Tory said community programs like these pay off. “Like all other measures they don’t represent a magic answer, which no one has but they form an important part of the answer. The rise in shootings we have seen in 2018 right up to this day is simply not acceptable,” Tory said. Over 1,500 young people will be helped by the programs. Chief Mark Saunders says proactive measures are part of the solution to stopping violence crime by allowing young people to make better decisions earlier in their lives. He thanked the federal government for listening and moving in the right direction as well as the City of Toronto for working collectively with the Service to find the right solutions.